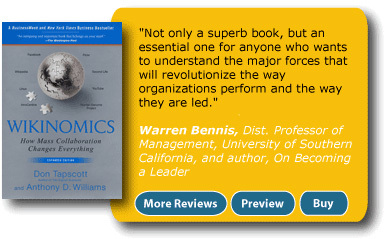 International bestseller Wikinomics has been revised and expanded to include an entirely new chapter and preface. Find out how the authors have responded to their detractors and discover timely new insights about how to put the principles of wikinomics to work in your business. Rob McEwen, the Goldcorp, Inc. CEO, former investment banker, and gold mining newbie, who used open source tactics and an online competition to breathe new life into a struggling business cobbled by the rules of an old-fashioned industry. Flickr, Second Life, YouTube, and other thriving online communities that transcend social networking to pioneer a new form of collaborative production that will revolutionize markets and firms. Smart, multibillion dollar companies like Procter & Gamble that cultivate nimble, trust-based relationships with external collaborators to form vibrant business ecosystems that create value more effectively than hierarchically organized businesses.